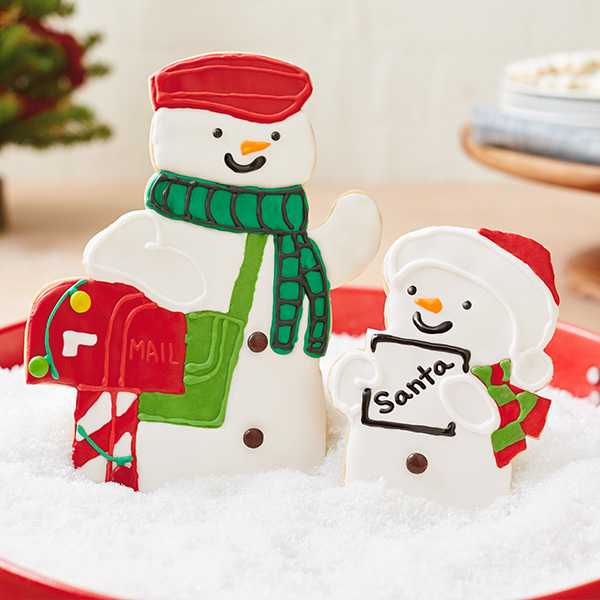 Follow the links for tips on sugar cookie dough and royal icing from Bernard Shondell, Hallmark’s resident cookie expert. Print the templates and cut out both snowmen. Roll it to approximately ¼ inch thick. Make sure you have big enough pieces to cut out both snowmen. Carefully move the dough to a parchment lined baking sheet and freeze for about 20 minutes. Trace around each template with the tip of the craft knife, then use the knife to cut the shapes out of the dough. Put the cookies in the oven, and start peeking at them at about 10 minutes. It may take more like 15—the edges should be just golden. Allow the cookies cool completely before icing. We suggest decorating the next day just to be 100% sure they’re ready. Make the royal icing colors. We used lots of white, the teeniest bits of black and orange, plus red and two different shades of green. To get those, use a little extra yellow for the mailbag, and a little extra blue for the scarf. Fill individual piping bags and fit with a #1 piping tip to decorate. We began decorating the cookies with the white icing, following the template lines. If you’re not comfortable free-handing the design, you can cut the template into pieces (mailbox, scarf, hat, etc.) and trace them onto the cookie with a food marker. Let the icing dry at least 30 minutes before applying adjacent colors. As it dries, the icing will turn from a glossy to a matte finish. Attach candies as buttons and light bulbs using a little bit more icing.